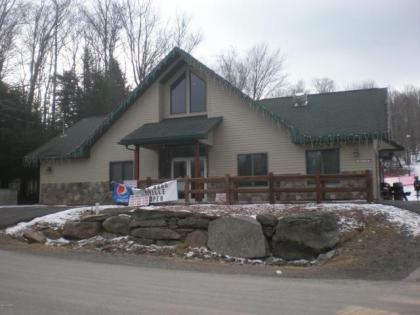 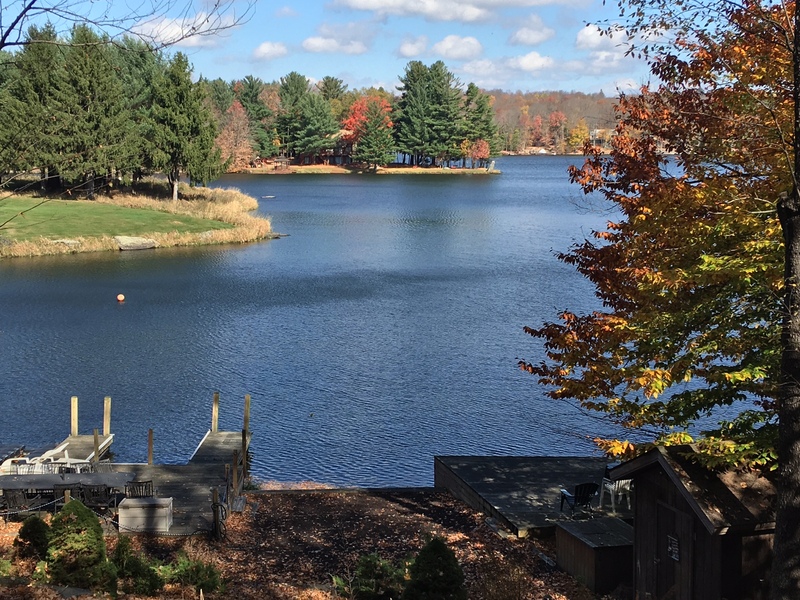 This large lakefront resort home is perfect for your next Pocono vacation! 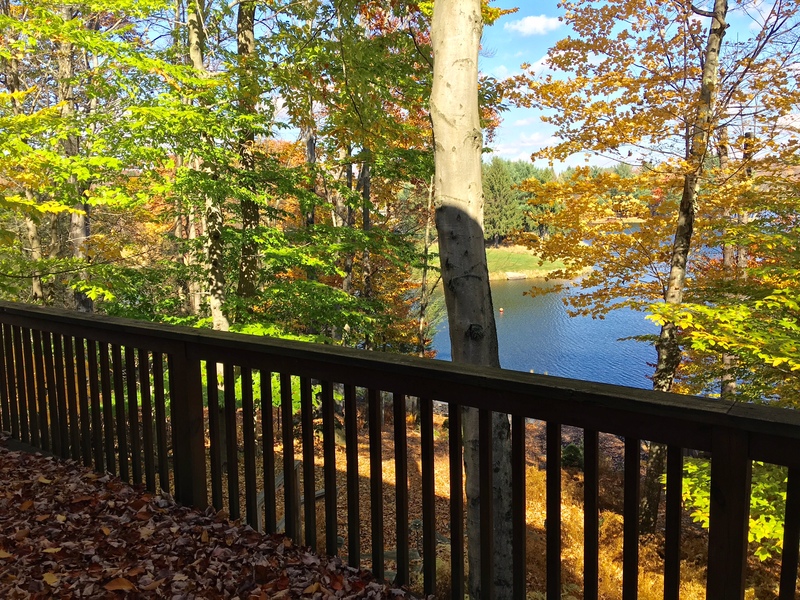 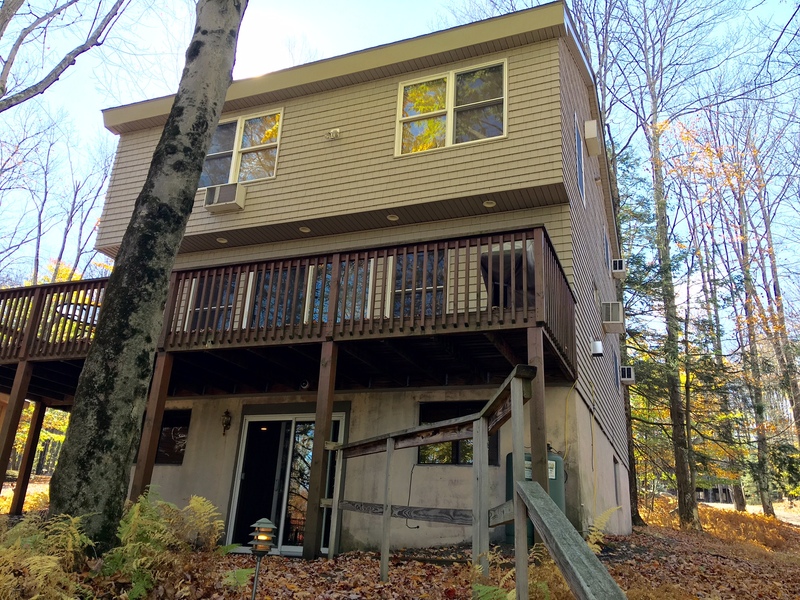 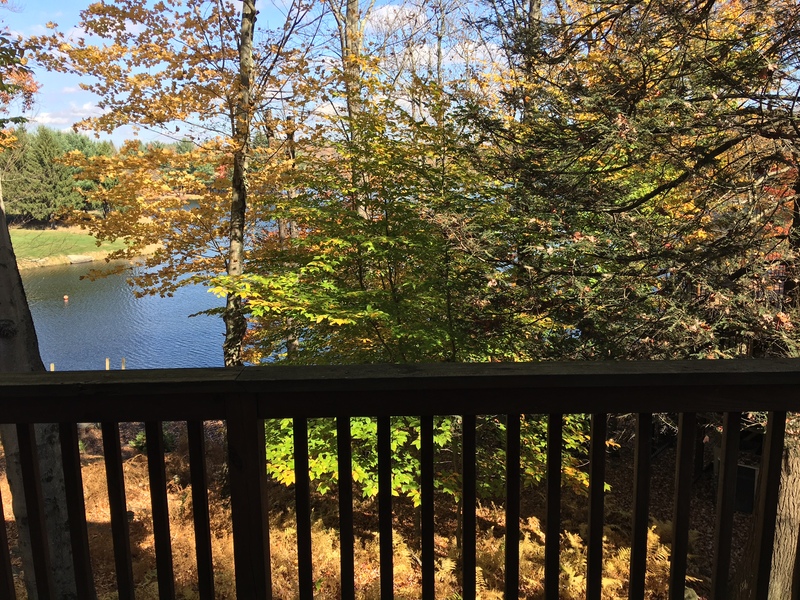 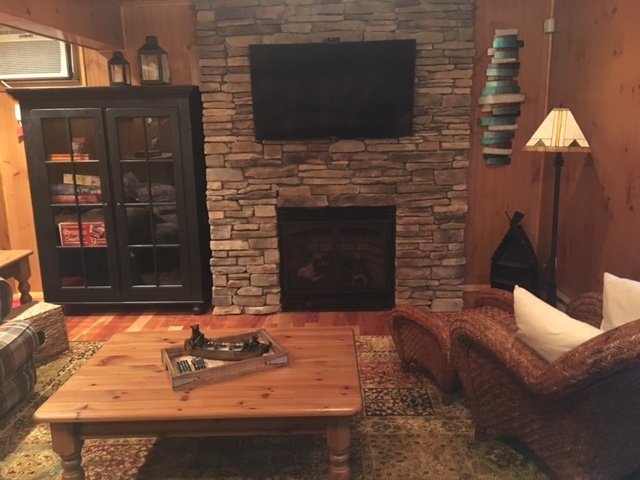 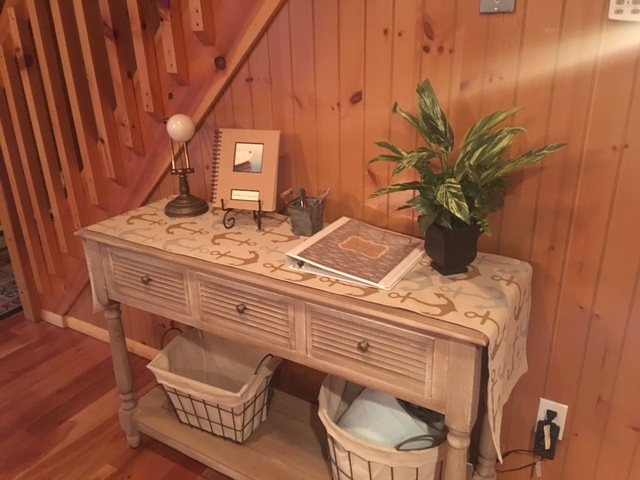 Nestled in a beautiful wooded area this 6 bedroom lakefront vacation home is located in The Hideout, a resort community in the Lake Region of the Poconos Mountains with serenity, privacy, and secure gated access. 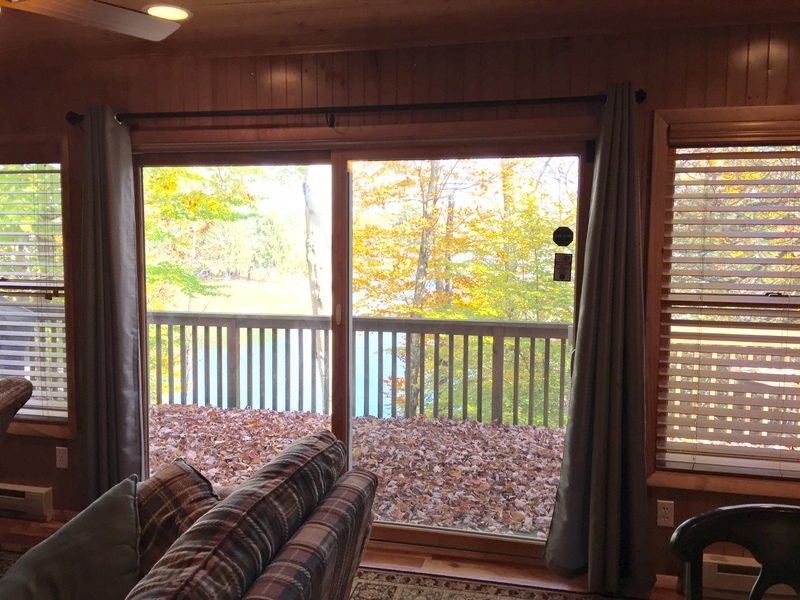 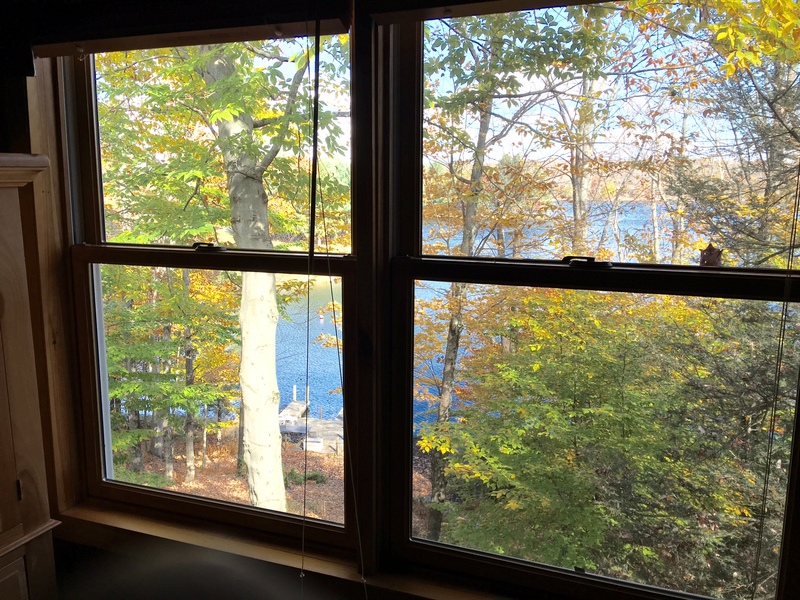 This Poconos lake house escape features three living levels and many windows looking out to Roamingwood Lake. 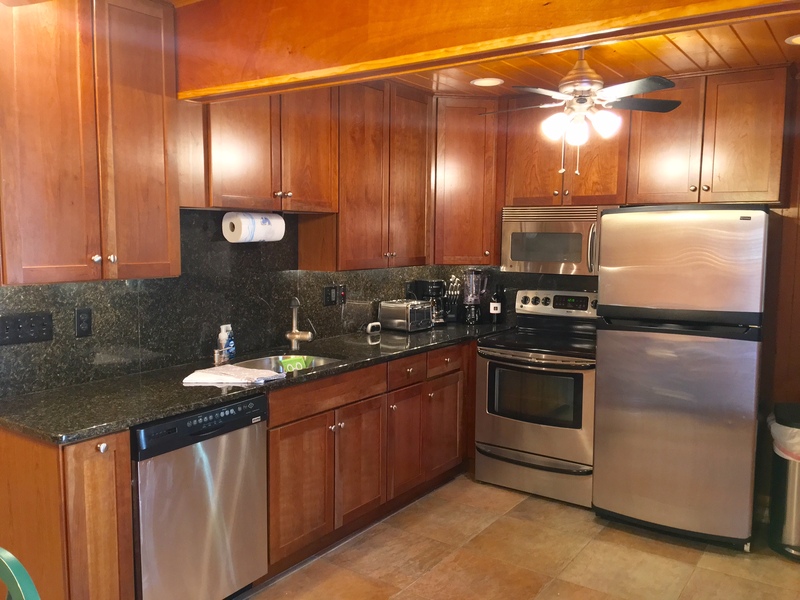 The fully equipped kitchen includes everything you need to dine in, as well as two separate dining areas with views out to the woods. 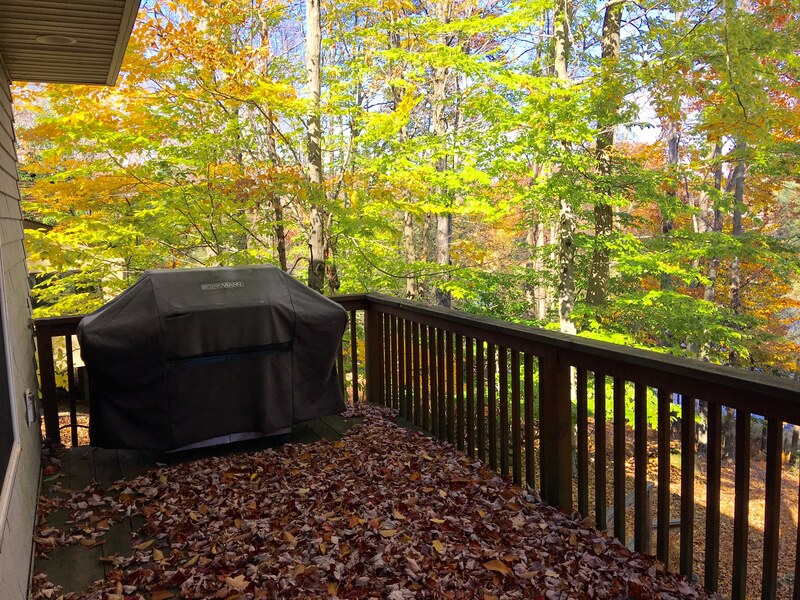 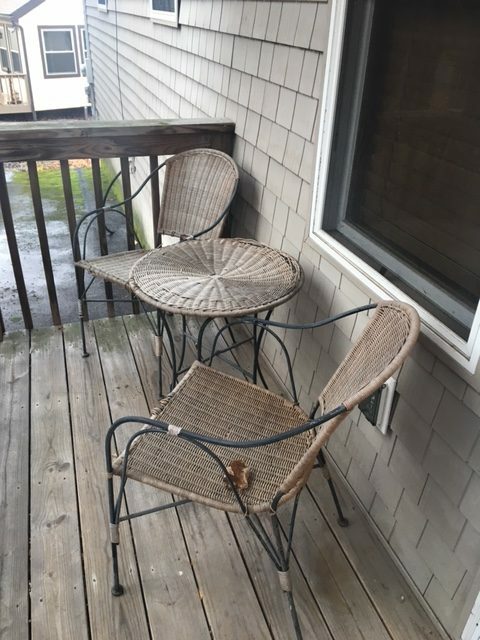 There is also an outdoor barbecue grill on the deck. 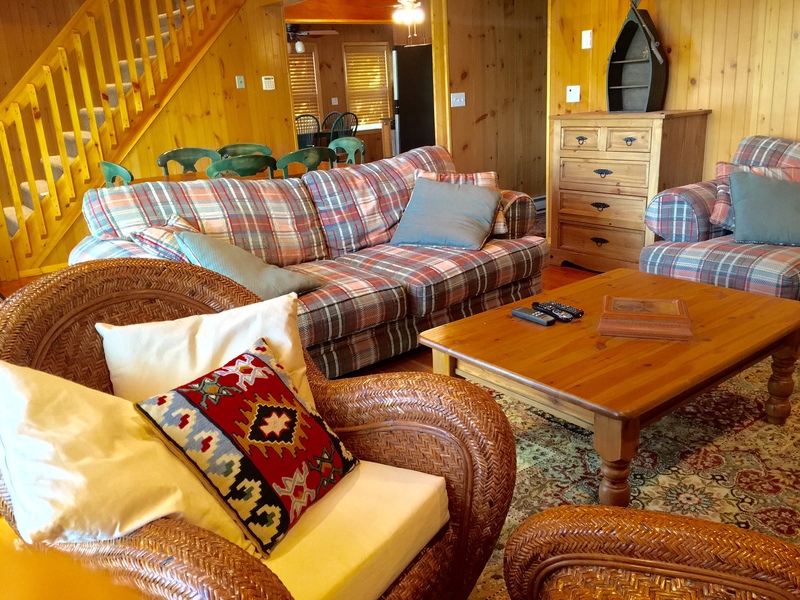 This resort home is steps away from your own private two docks with seating. 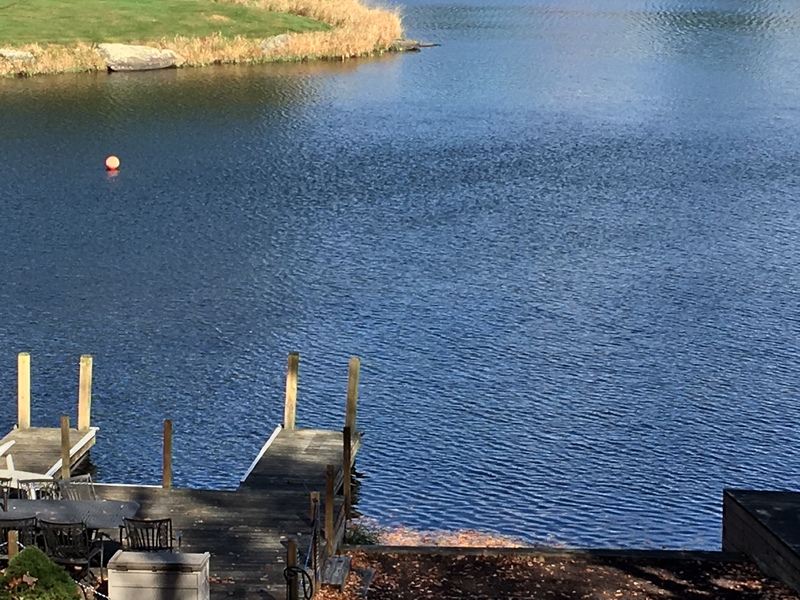 Relax by the lake and soak in the sun! 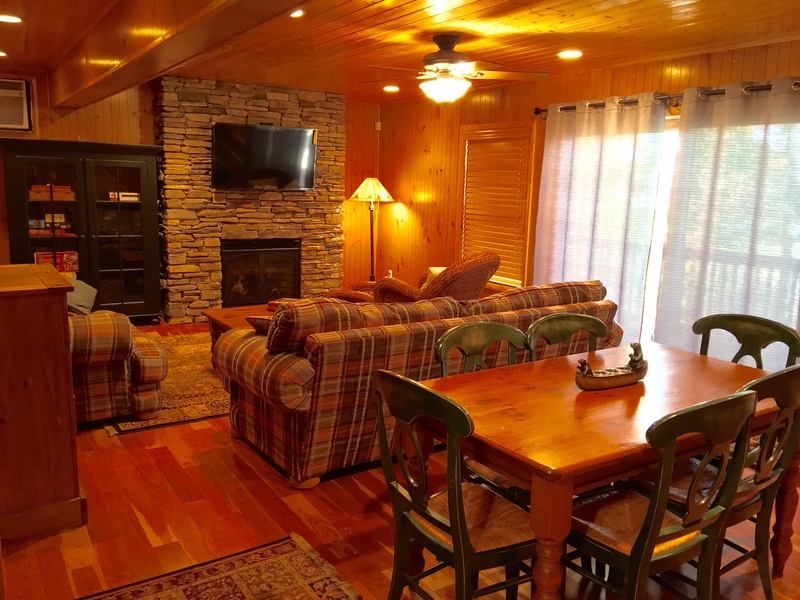 This home is perfect for your next family vacation or couples’ getaway in the mountains. 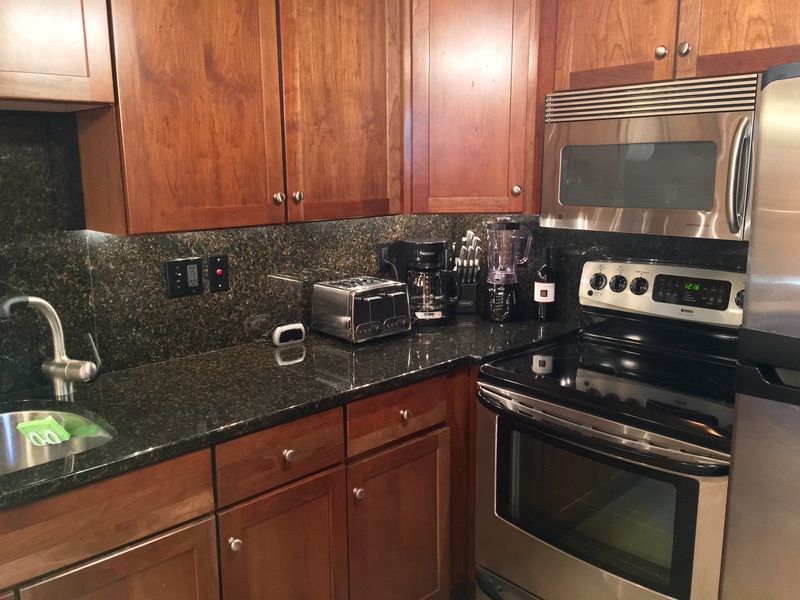 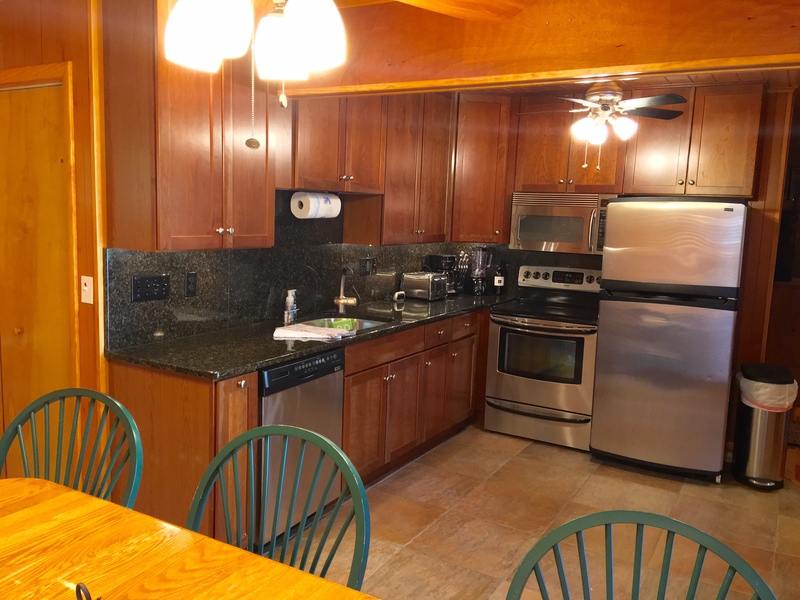 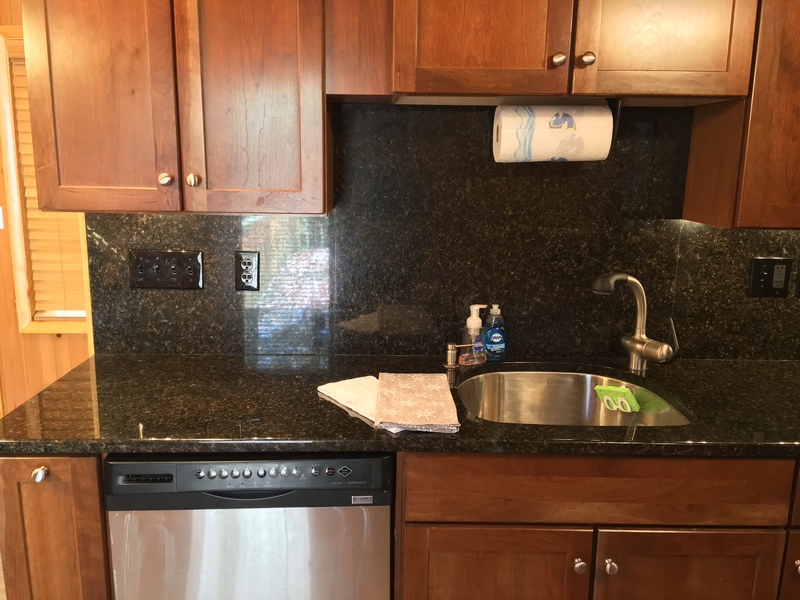 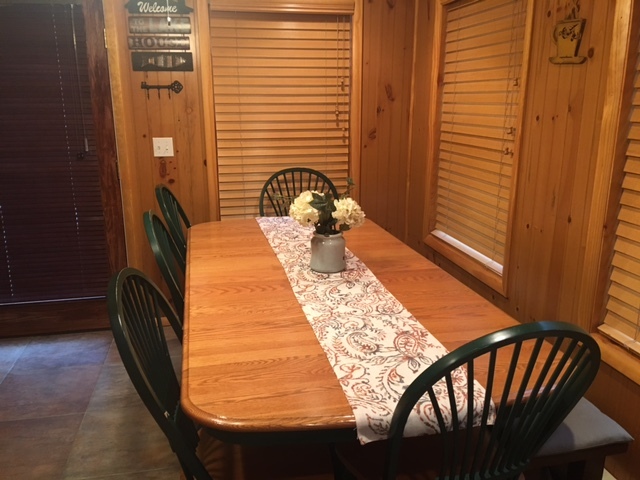 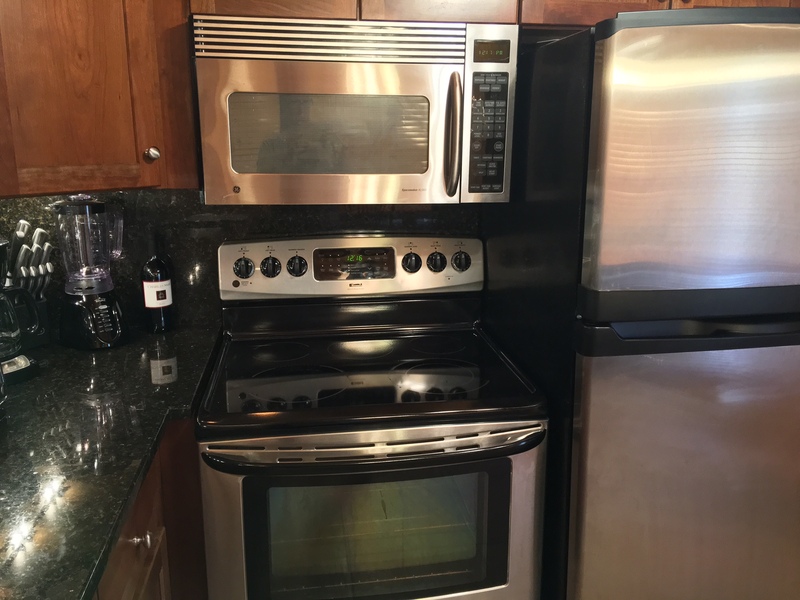 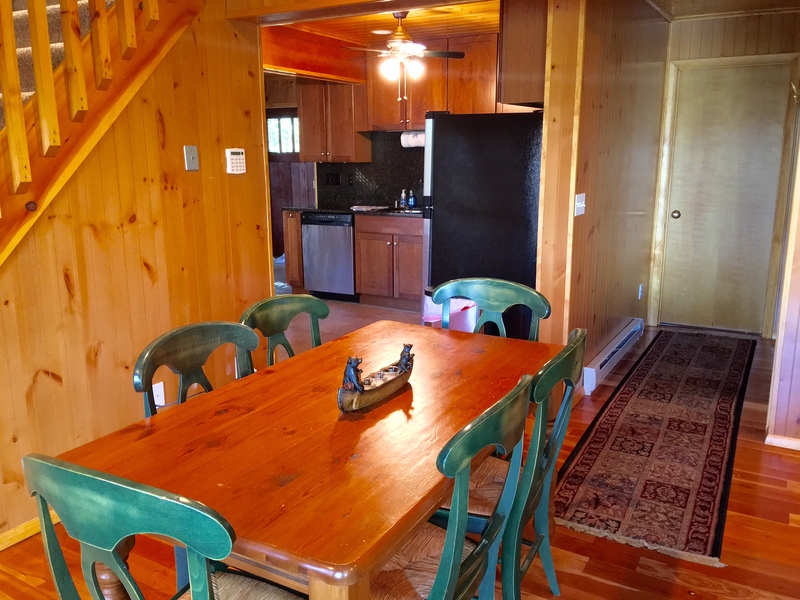 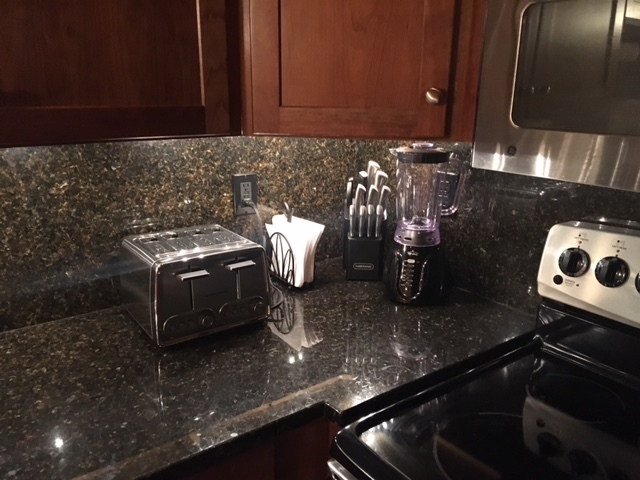 This beautiful Poconos Lakeside Escape features a full modern country kitchen, granite counter tops and is equipped with everything you need to cook a spectacular meal. 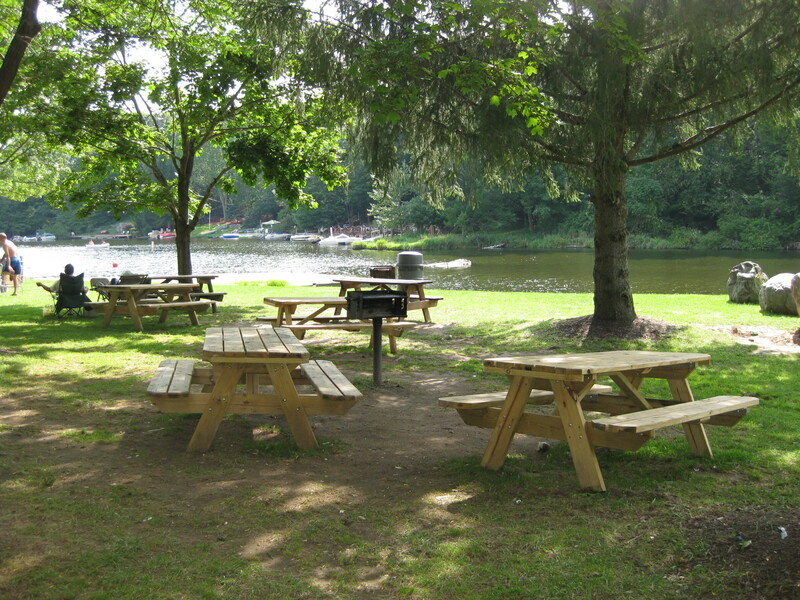 Or, after a full day of enjoying all the Poconos have to offer, relax, grill up dinner from one of the many local farm merchants on the barbecue. 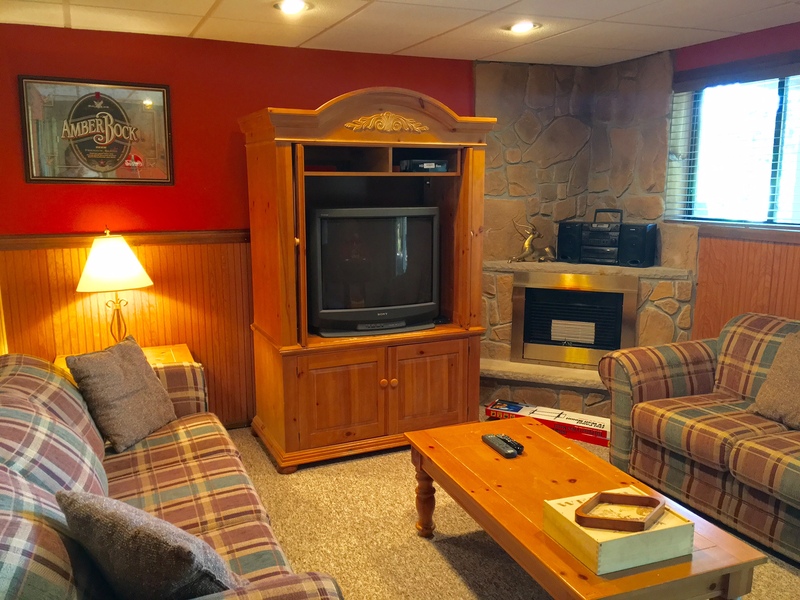 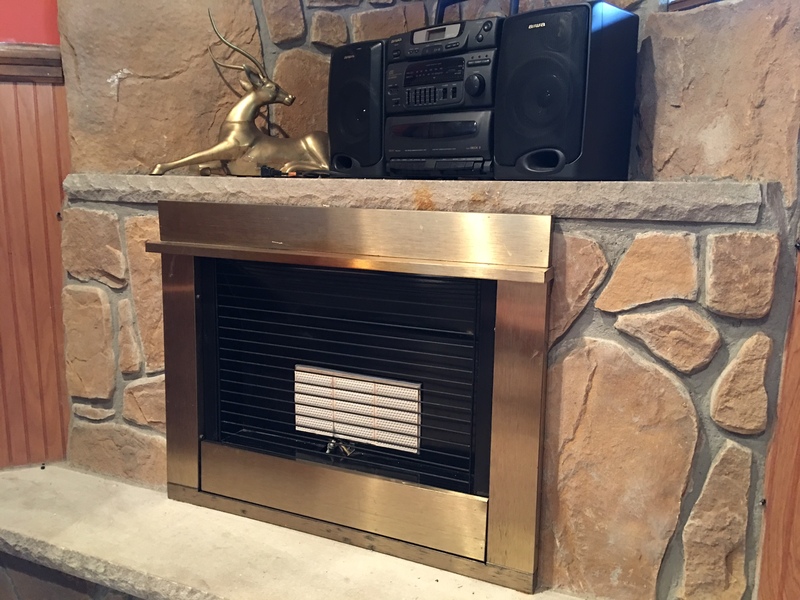 This home features six bedrooms with SMART TV’s and many AC units. 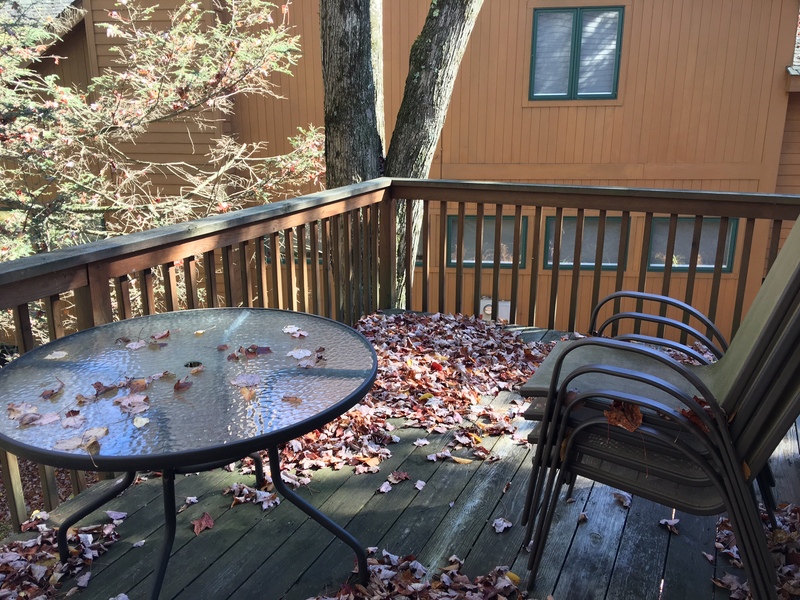 Which is complimented by 4 baths, offering plenty of room for enjoying your next Poconos getaway. 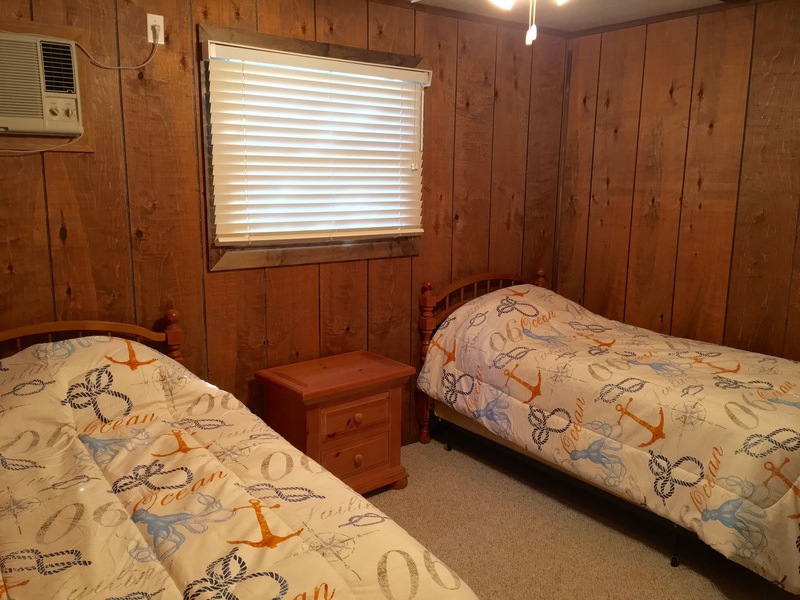 This rental home has sleeping accommodations on each of it’s three floors. 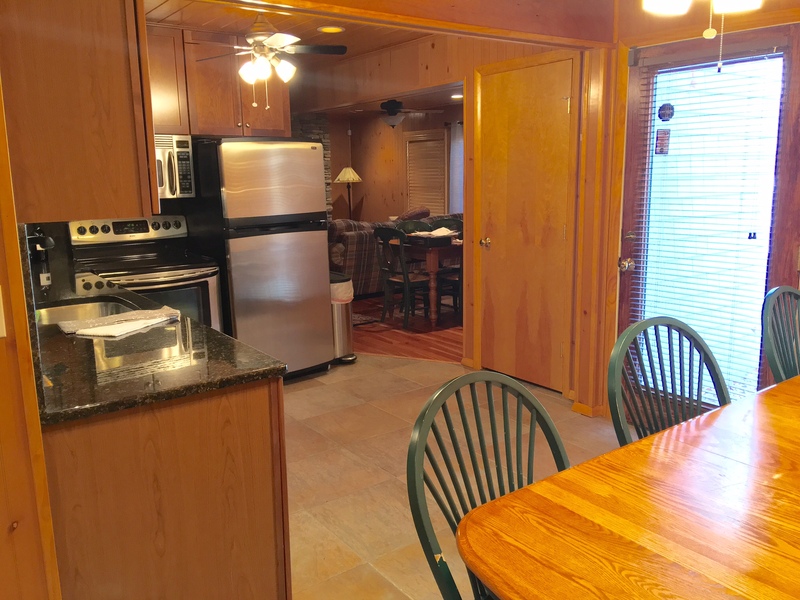 The main level (2nd floor) has the kitchen, two dining tables, living room, full bath and one bedroom with a King bed. 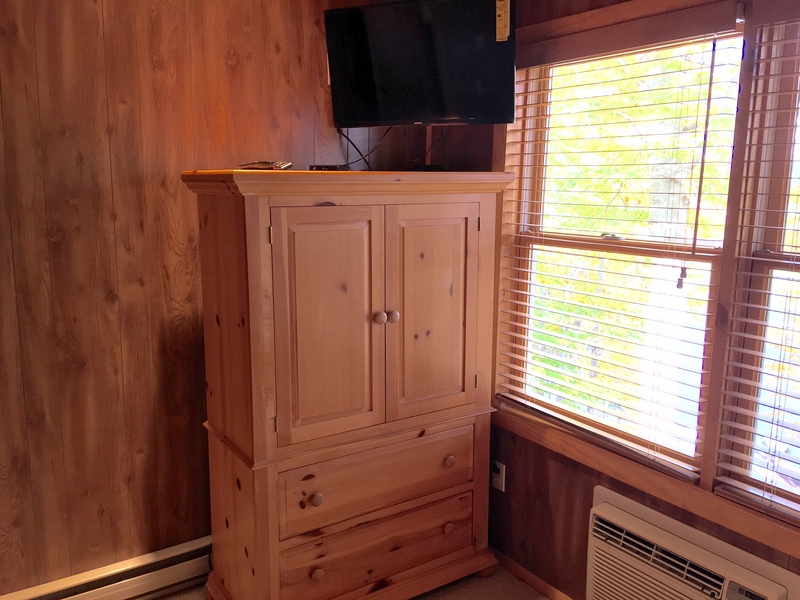 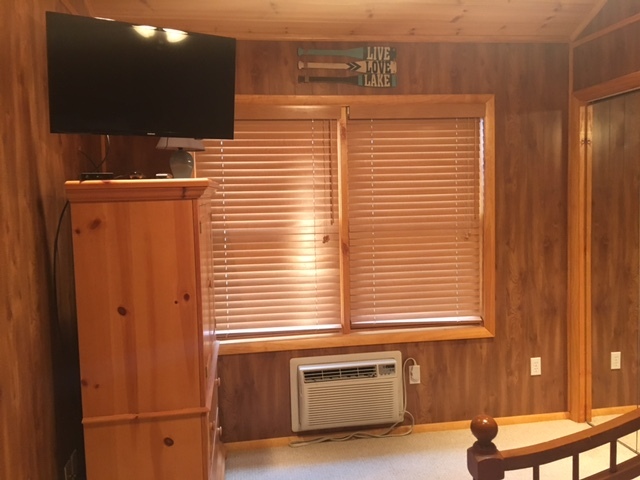 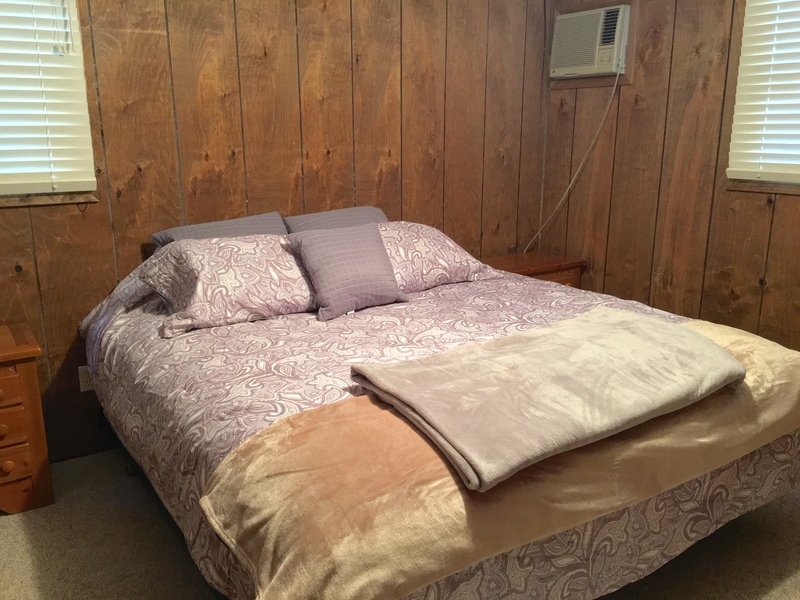 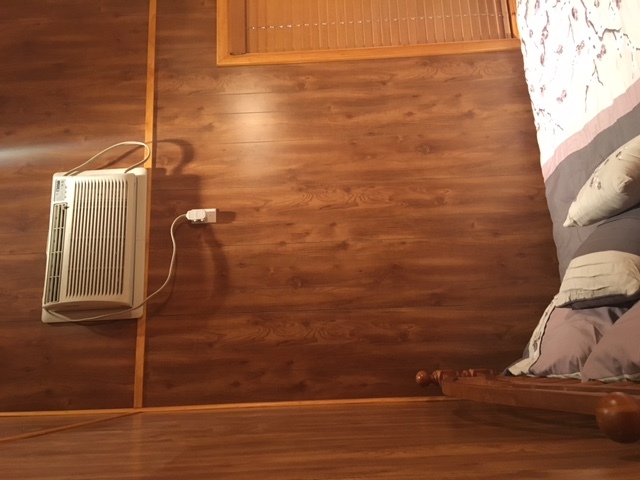 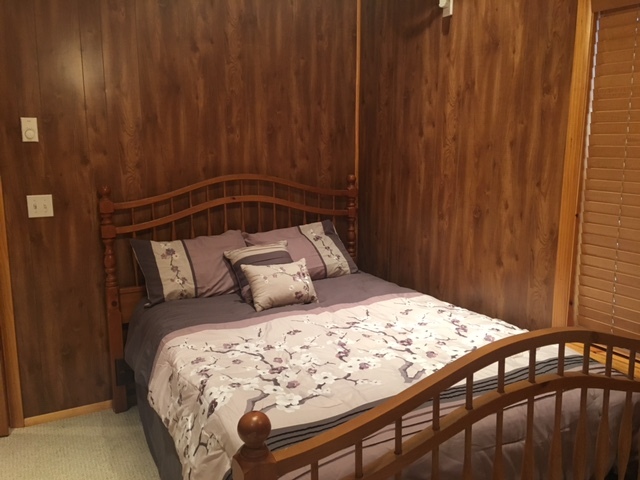 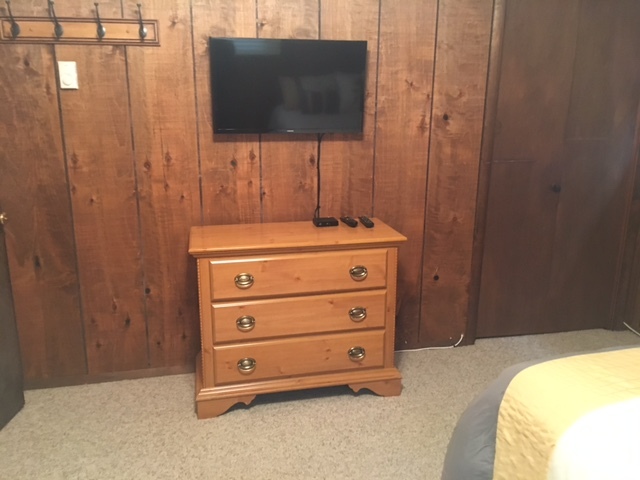 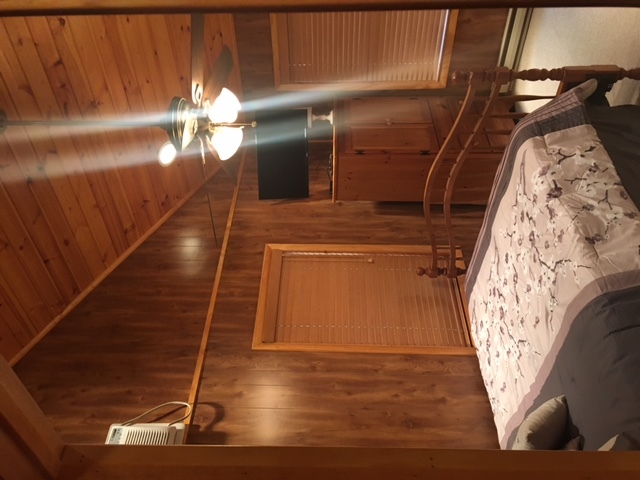 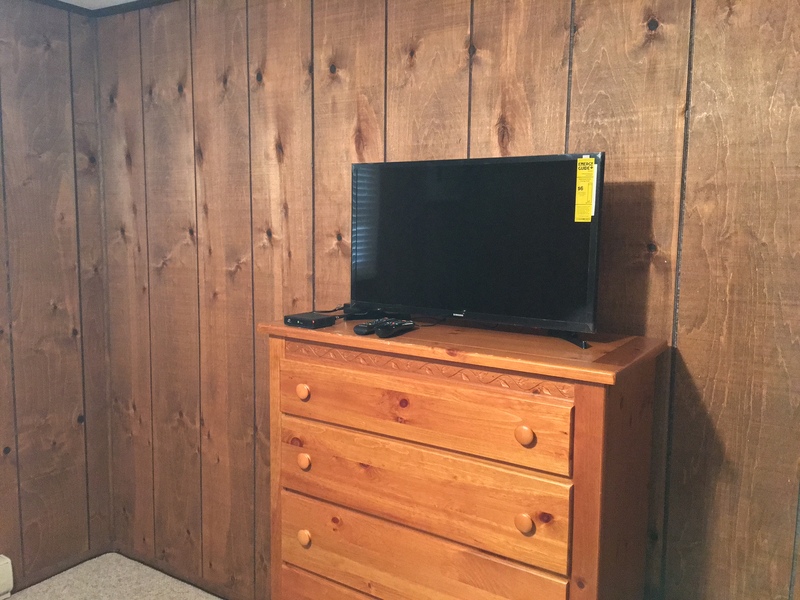 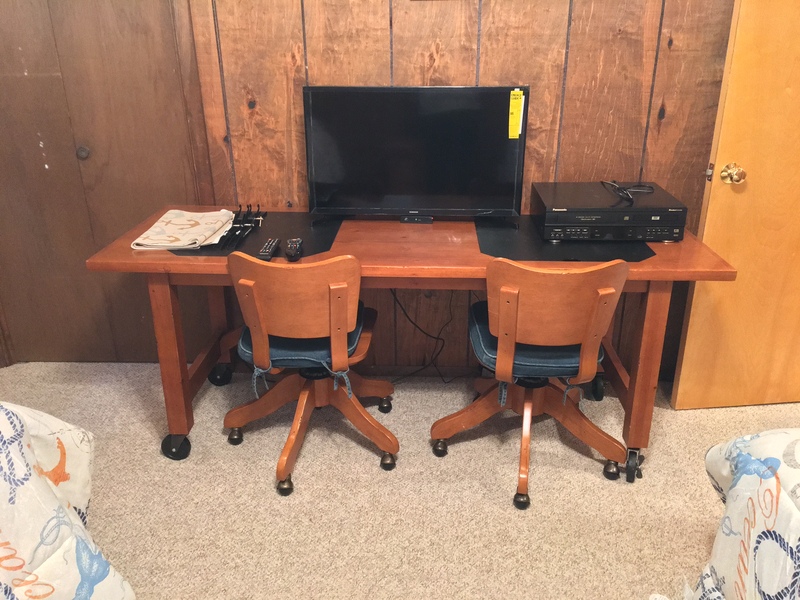 This bedroom has an AC unit and TV for you to enjoy. 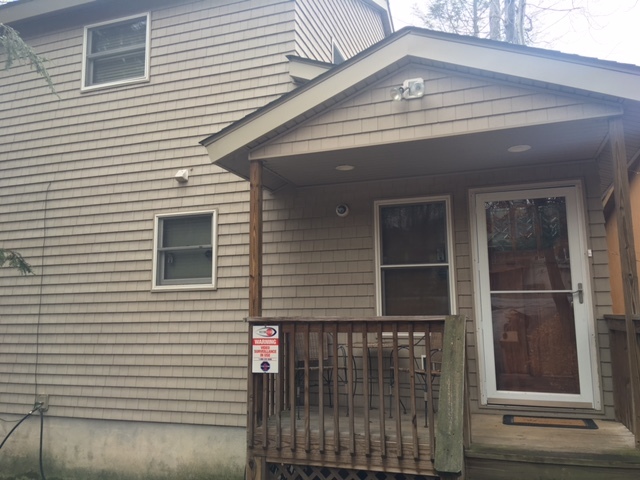 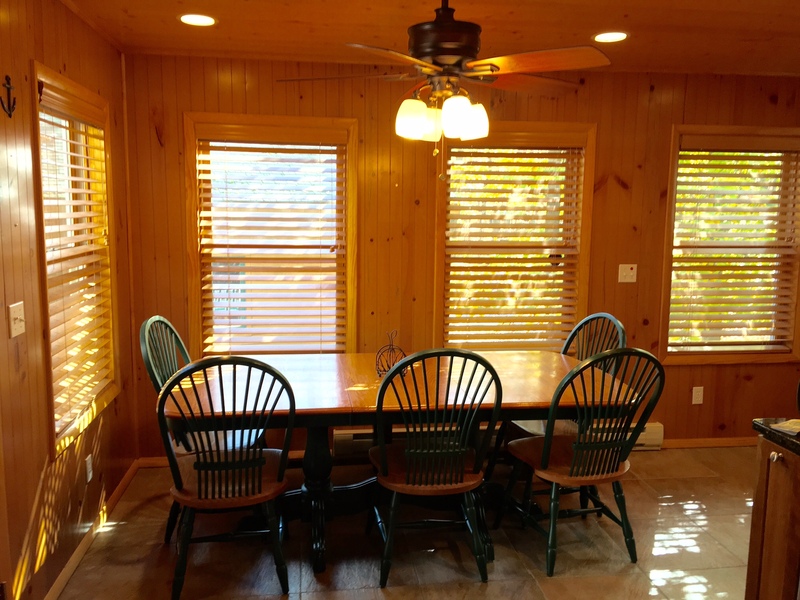 The upper level of the home has four bedrooms and two baths. 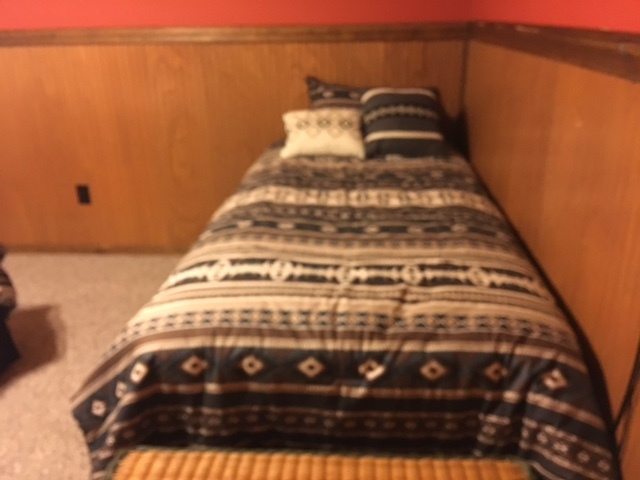 The first bedroom has two twin beds, the second, two full beds, the third has a king and the fourth has a full. 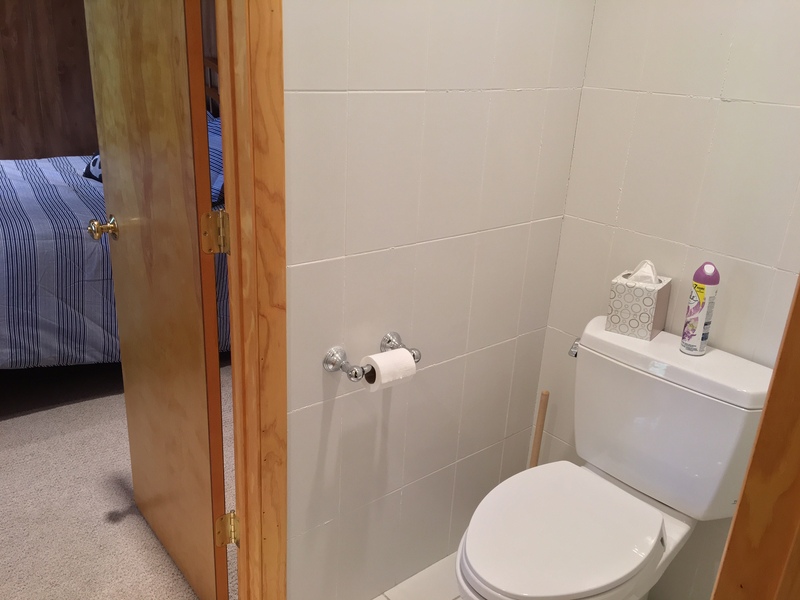 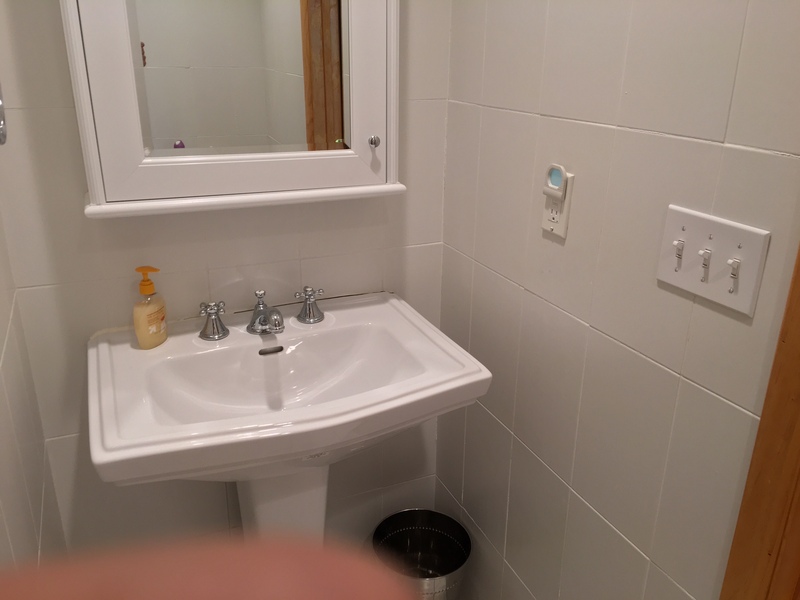 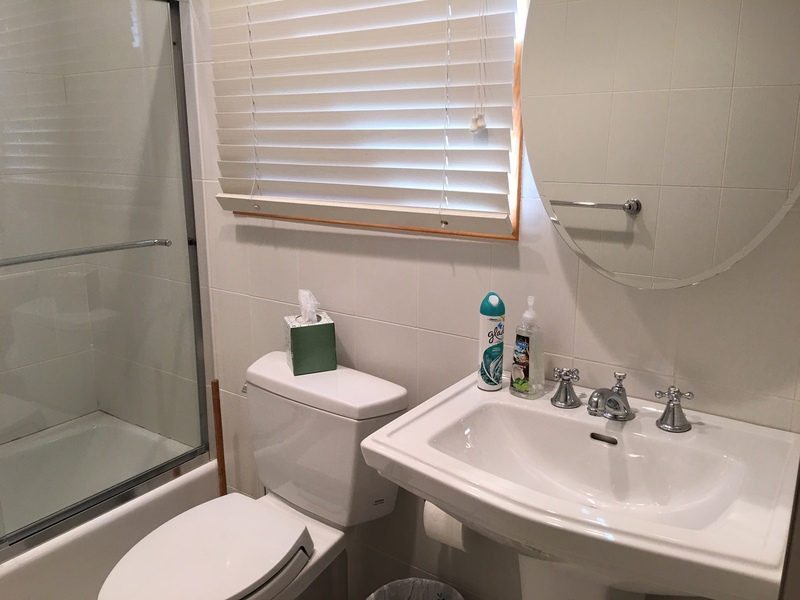 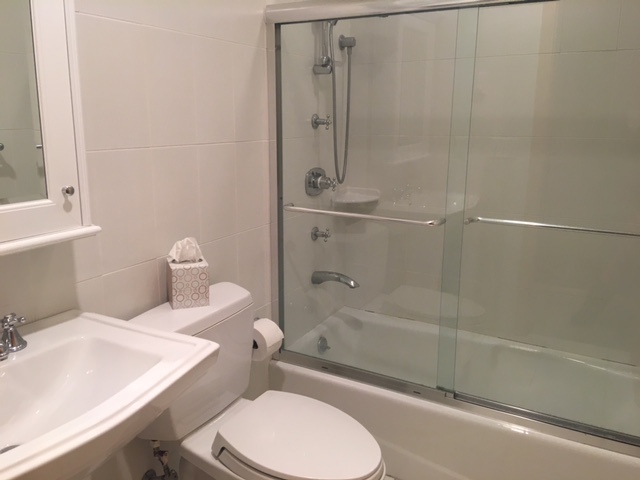 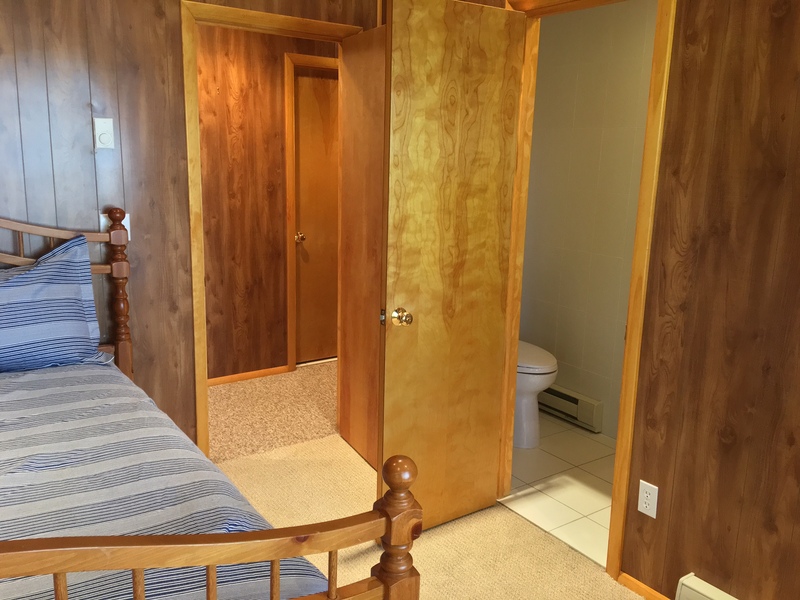 There is a full bathroom in the hallway outside the bedrooms while the other half bath is situated between two of the bedrooms. 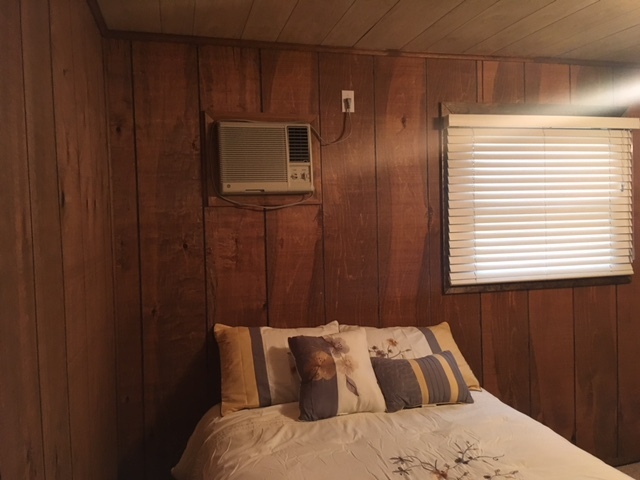 Each bedroom on this level has a AC unit and TV. 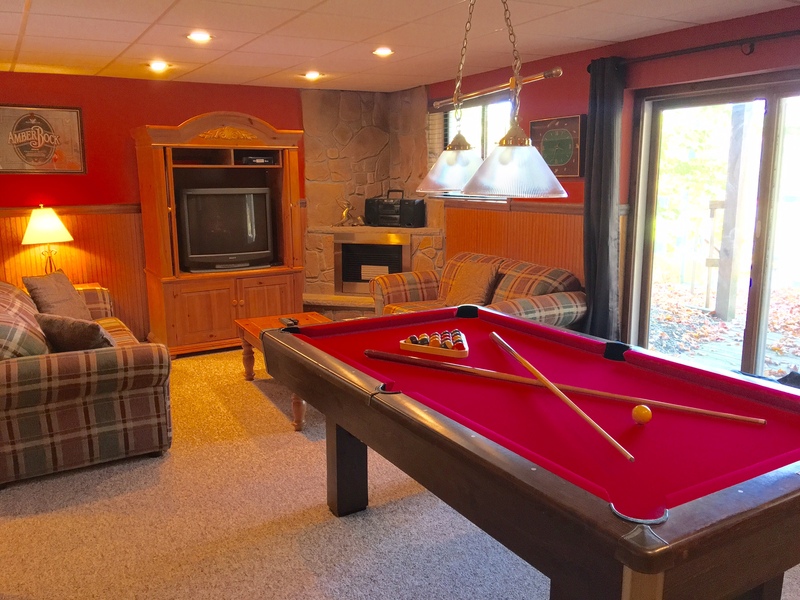 The lower level features a pool table, second living room, half bathroom, 6th bedroom with a King and Twin beds and laundry room. 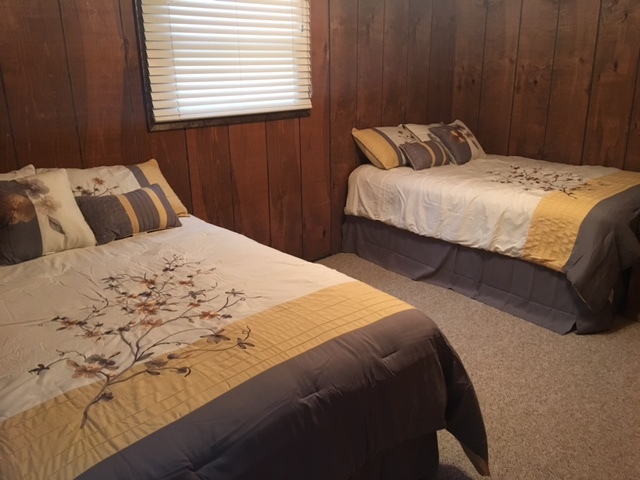 Making it perfect rental home for the groups that need a little bit more sleeping accommodations. 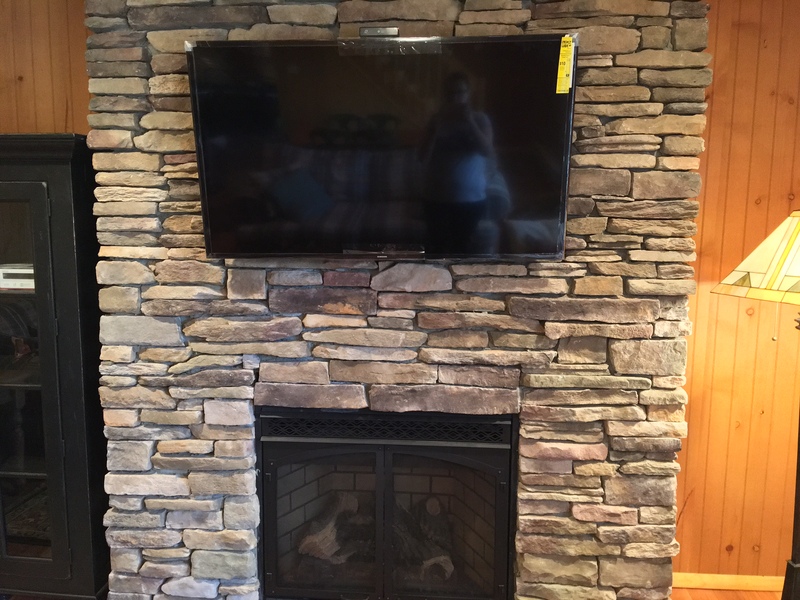 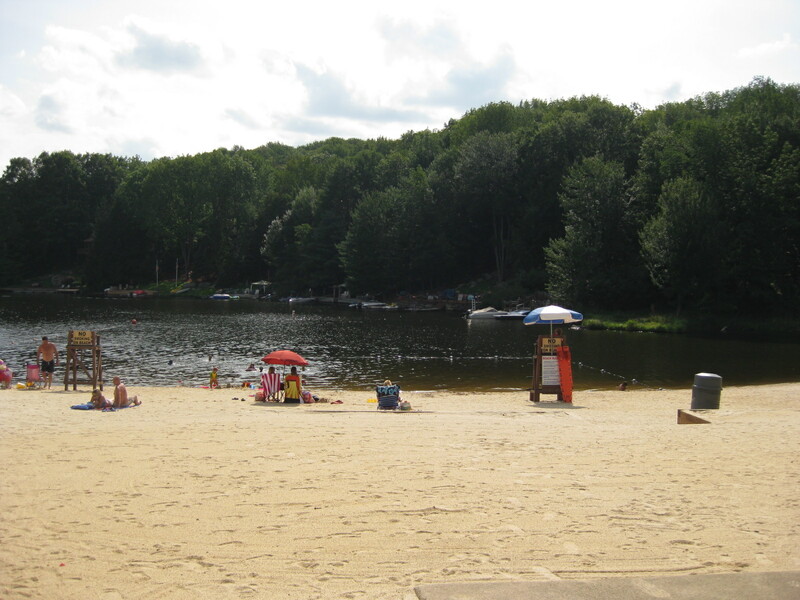 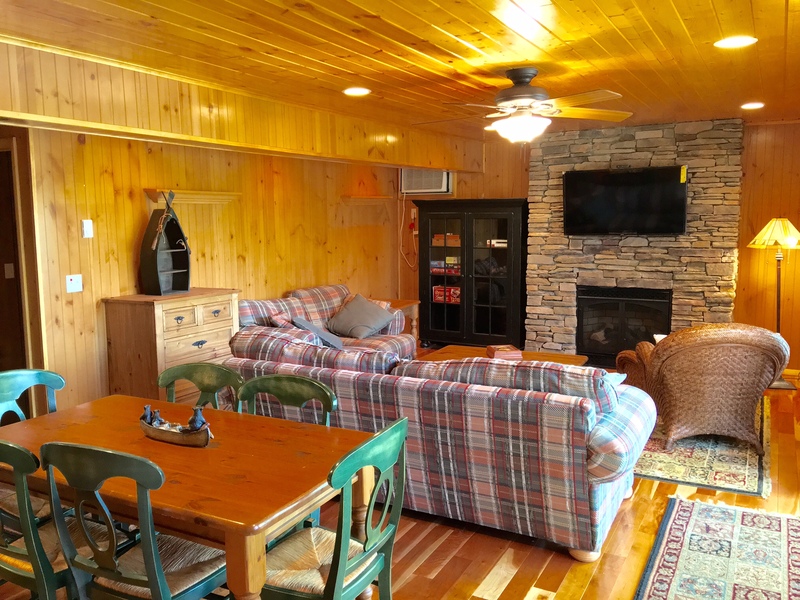 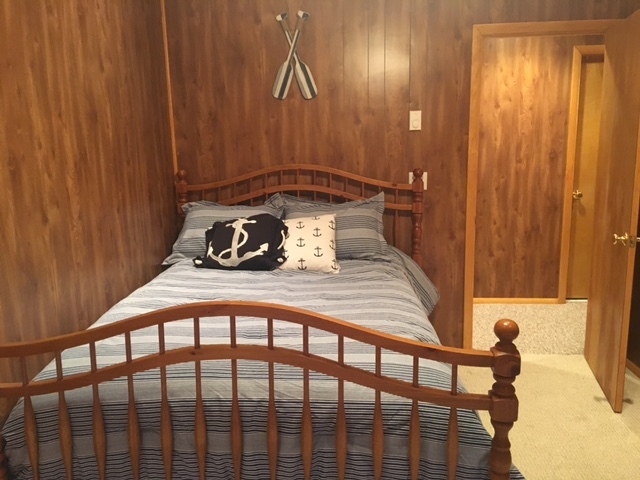 All our Poconos Lakeside Escape guests have access to all the amenities the Hideout has to offer, including our own private golf course, six lakes, pools, beaches, private three slope downhill skiing and snowboarding with equipment rentals. 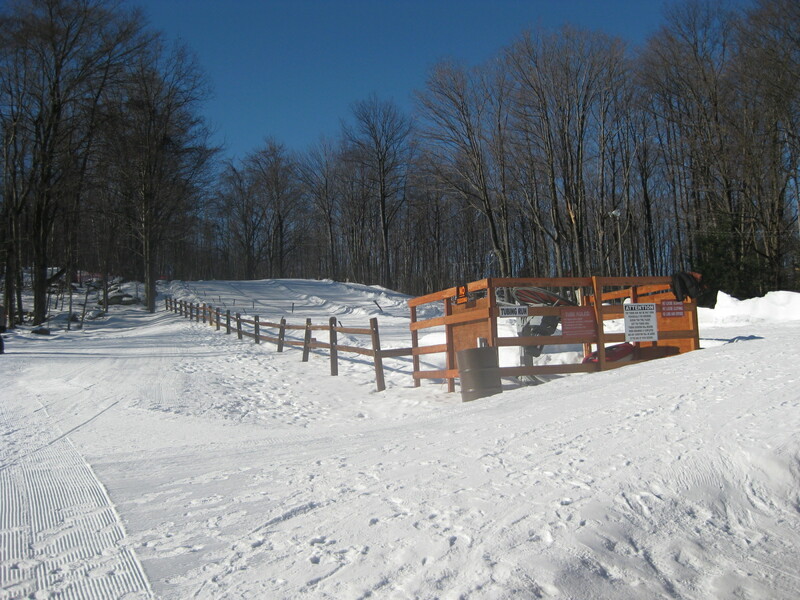 Try out the cross country skiing, ski lodge, parks, playgrounds, indoor and outdoor tennis. 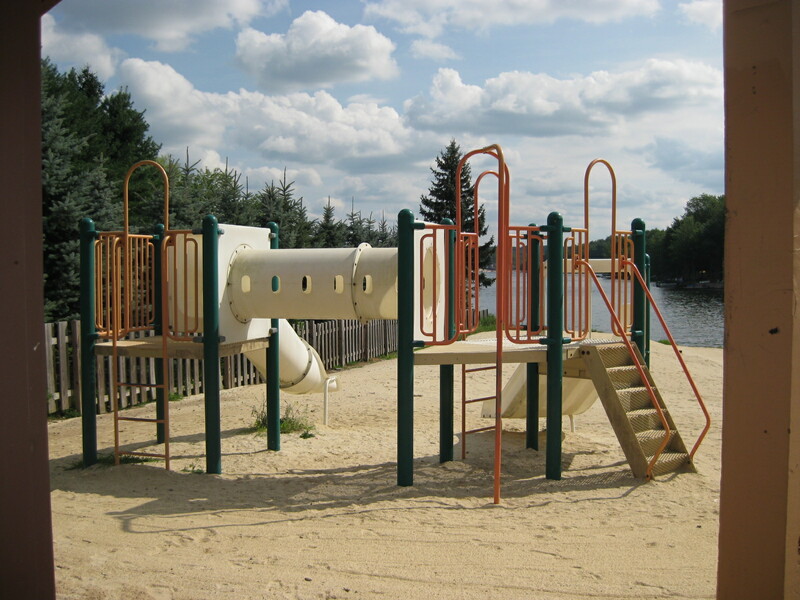 When you’re finished with these, try out the fishing, boating, hiking, indoor and outdoor basketball, softball, bocci, shuffleboard, horseshoes, sledding and ice skating. 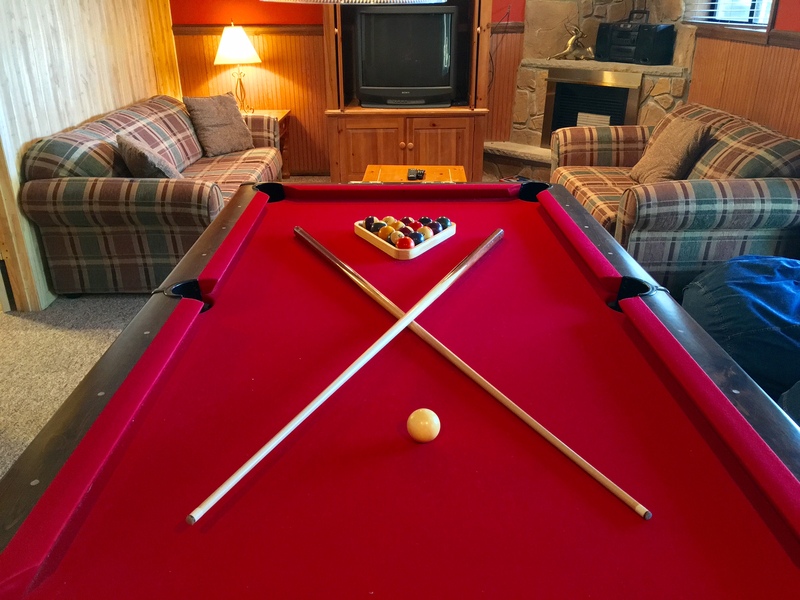 A vacation would not be complete without a little miniature golfing, handball, beach volleyball, a pavilion, campgrounds, rowboats and paddle boats and swim lessons. 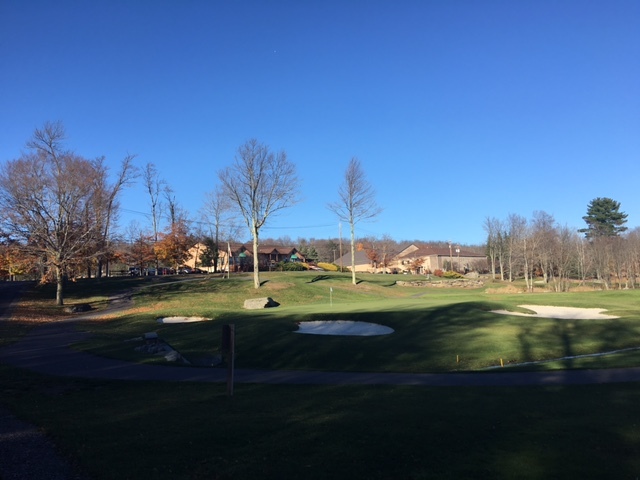 Check out the golf lessons, clubhouse, game room, gourmet restaurant, pub, tiki bar, arts and crafts center, gym, and a fitness center. 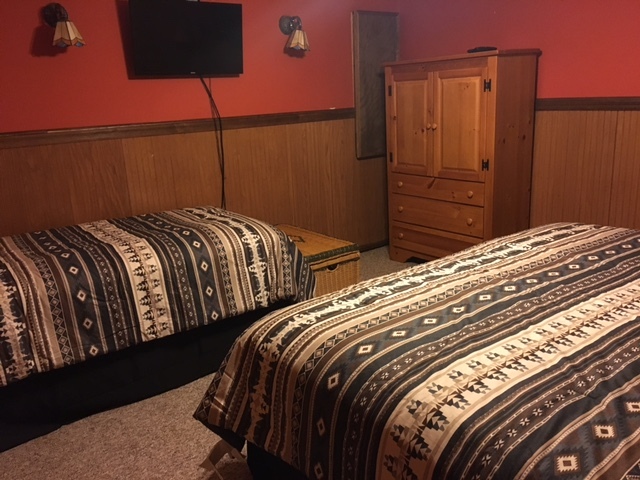 Day and evening activities in the Hideout may include but are not limited to pool and ping-pong tournaments, Night at the Races, movies, cards, bingo, luaus, nature walks, art classes, social groups, dances, and many other adult and children’s’ activities. 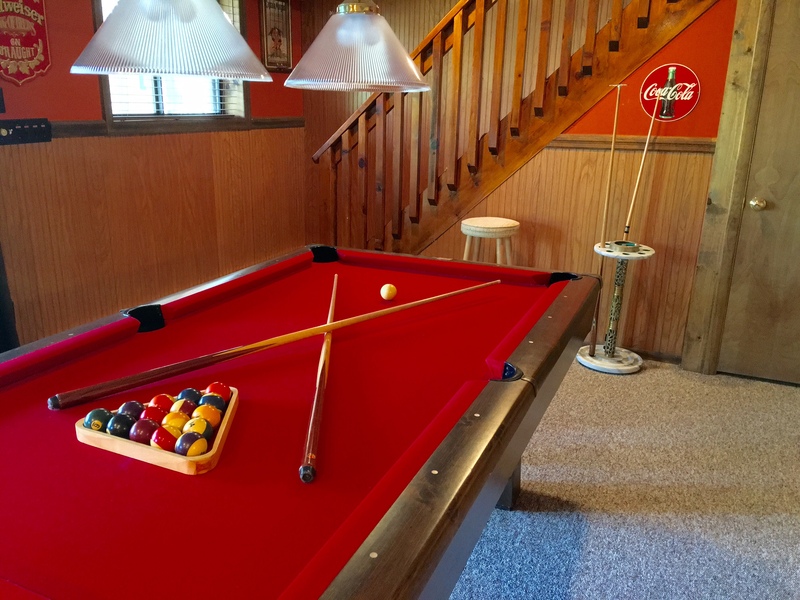 The Hideout amenities require a rental badge which makes the amenities free or a low cost. 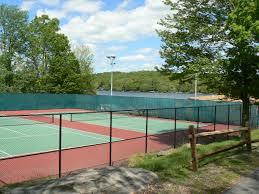 For instance, the beaches and pools are free while the gym or golf course will have a fee. 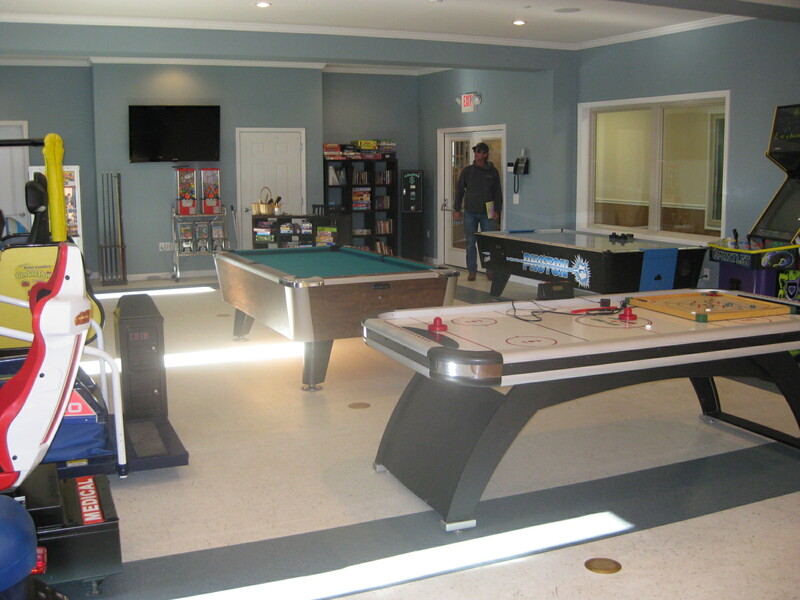 Contact our office for pricing and availability of amenities. 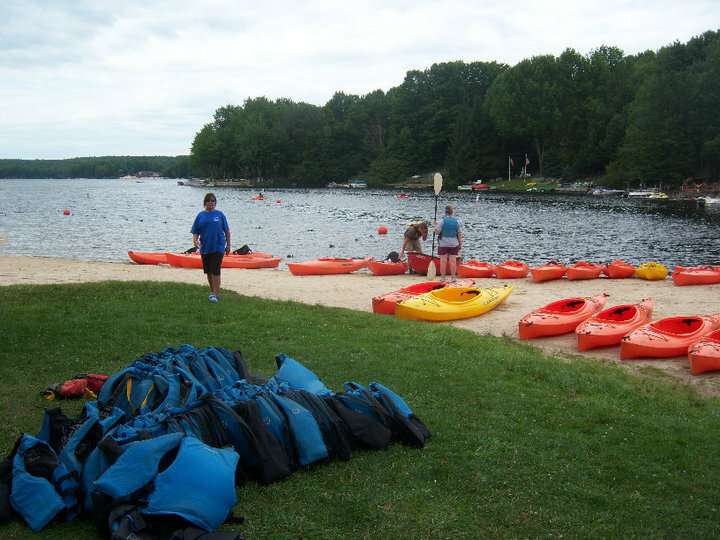 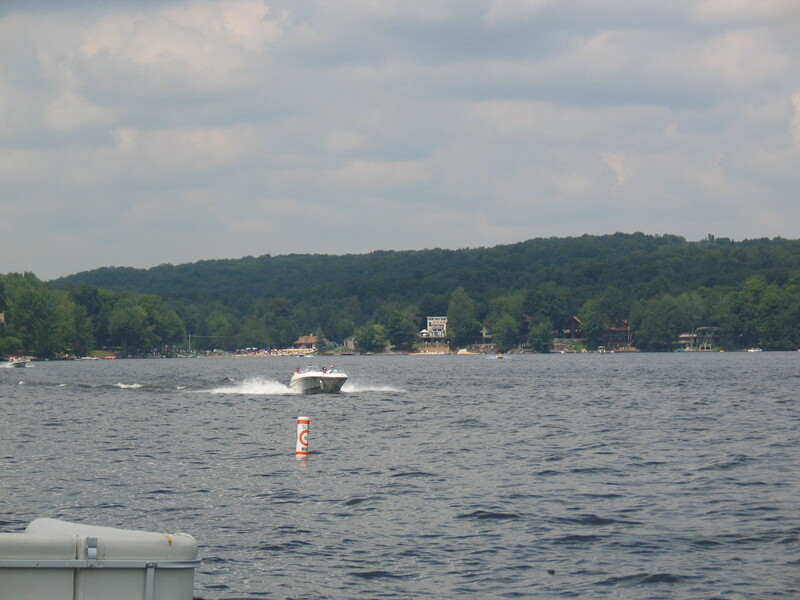 The Poconos Lakeside Escape is just within ten minutes from Lake Wallenpaupack, where you can rent jet-skis, powerboats, go parasailing and other types of watercraft. 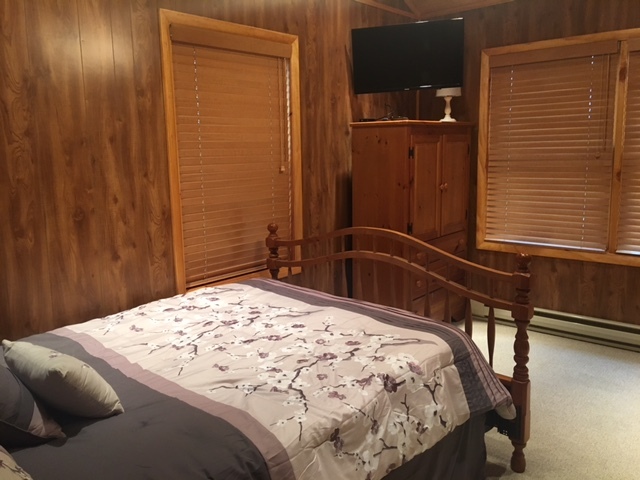 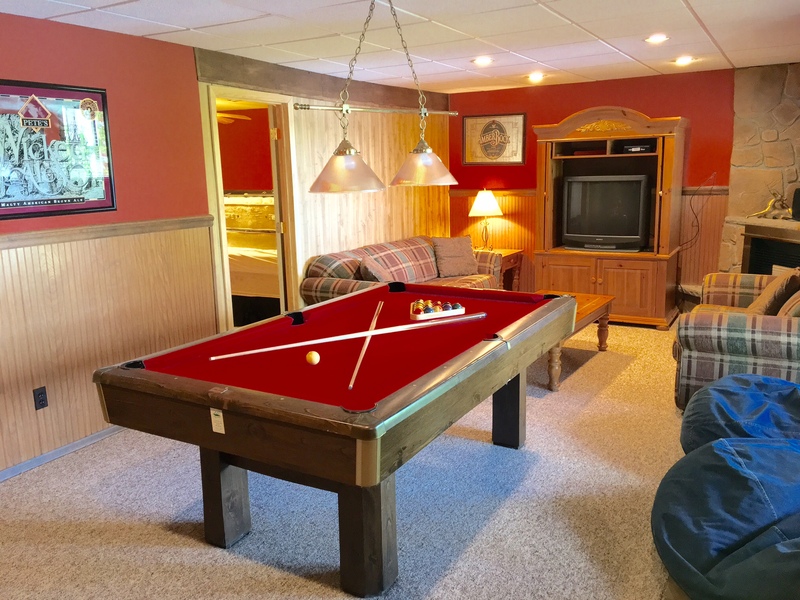 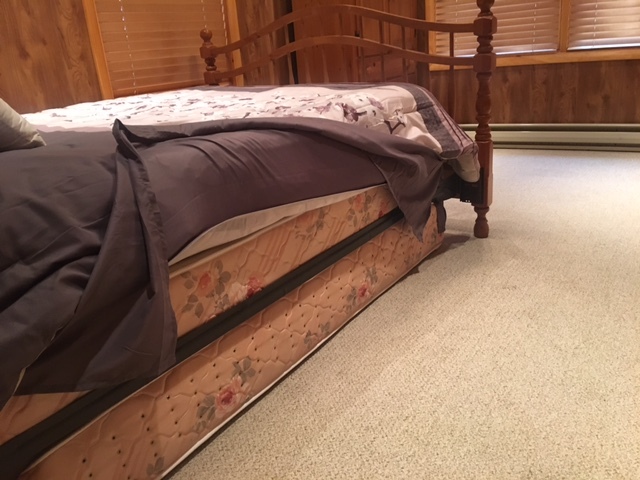 This home is just five minutes from a zoo, driving range, farmers markets, horseback riding, antique shops, and nature areas the Poconos are known for, including state game lands. 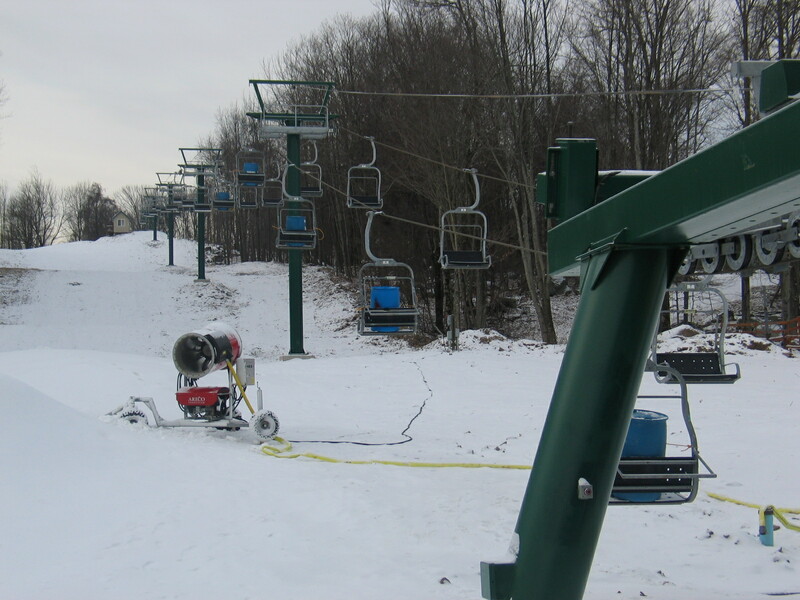 Also only one-half hour from several major ski areas, including Montage Mountain and Big Bear. 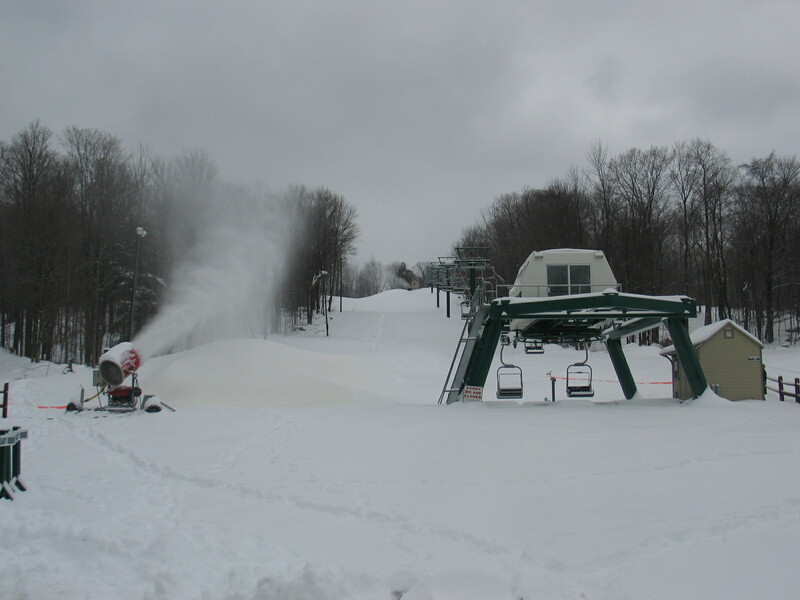 Others a little farther away are Camelback ski area, Elk Mountain and Shawnee Mountain, where you can go skiing, snowboarding, and snow tubing. 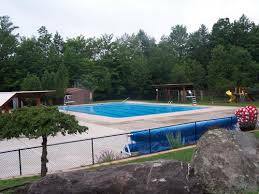 Also enjoy the museums, cultural centers, theaters and cinemas. 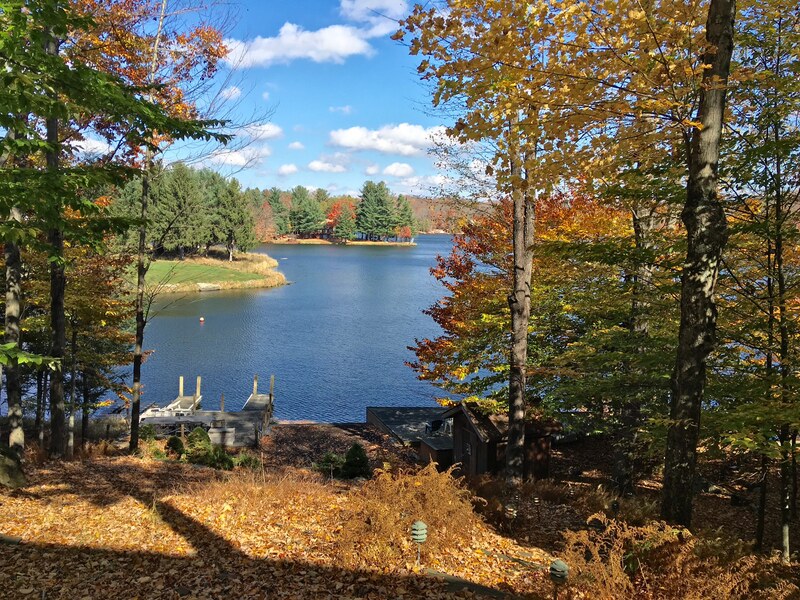 Indulge in the spa, or tray out several Poconos golf courses, water parks, malls, white-water rafting, outlet shopping, and historic sight-seeing tours. 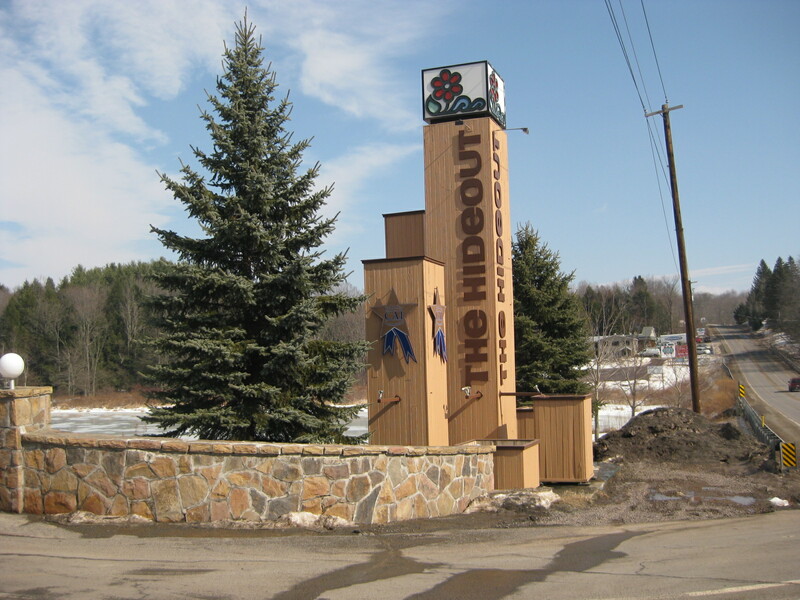 And it’s only five minutes to the best ribs anywhere – guaranteed. 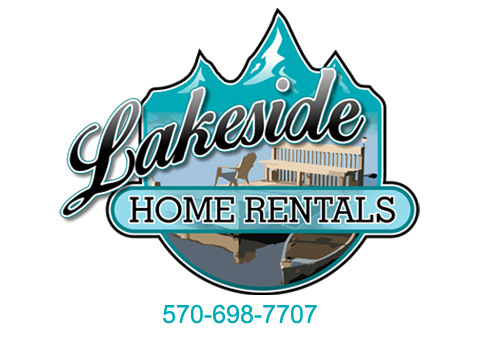 We offer discount coupons to these and many other special local activities and events, as well as provide event guides for local Poconos happenings. 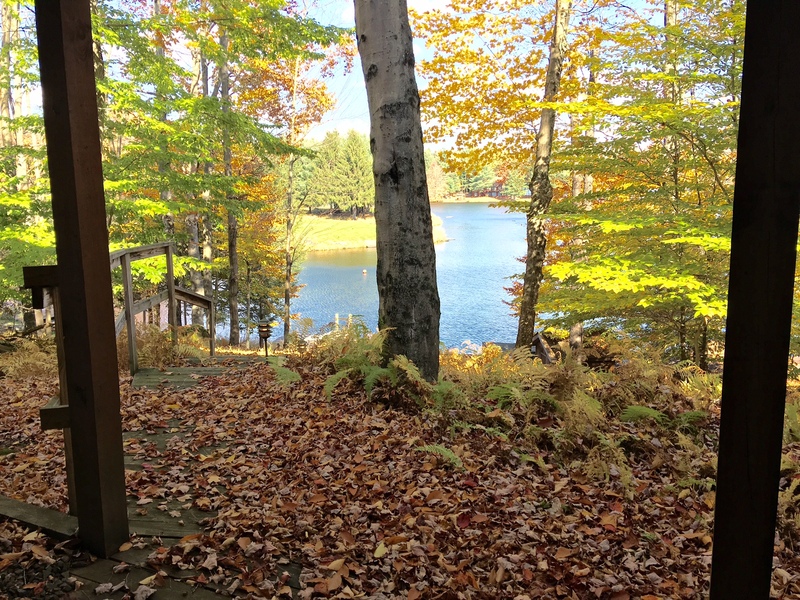 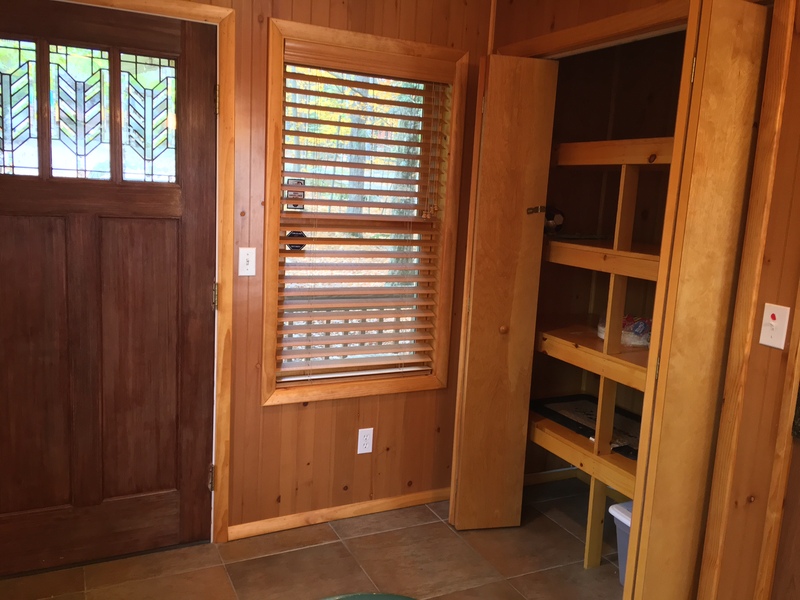 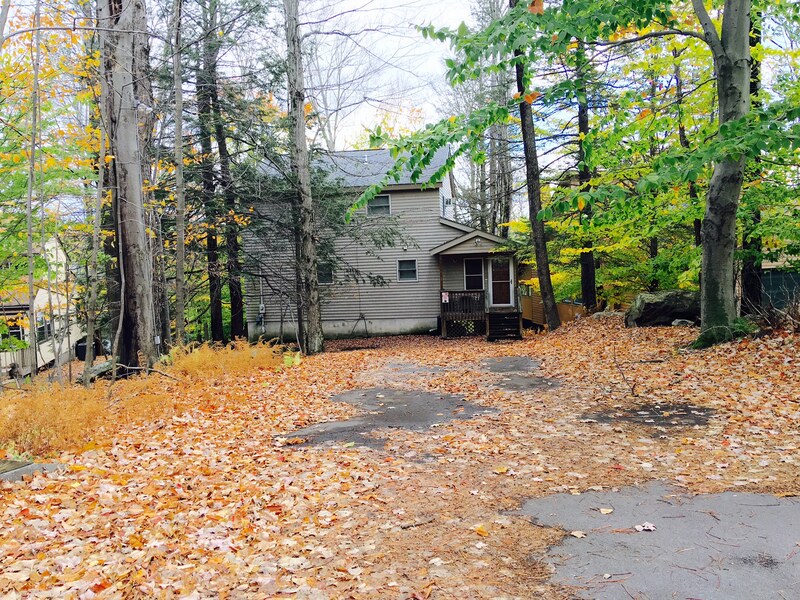 If you’re looking for a serene lakefront rental home, this rental property is just for you. 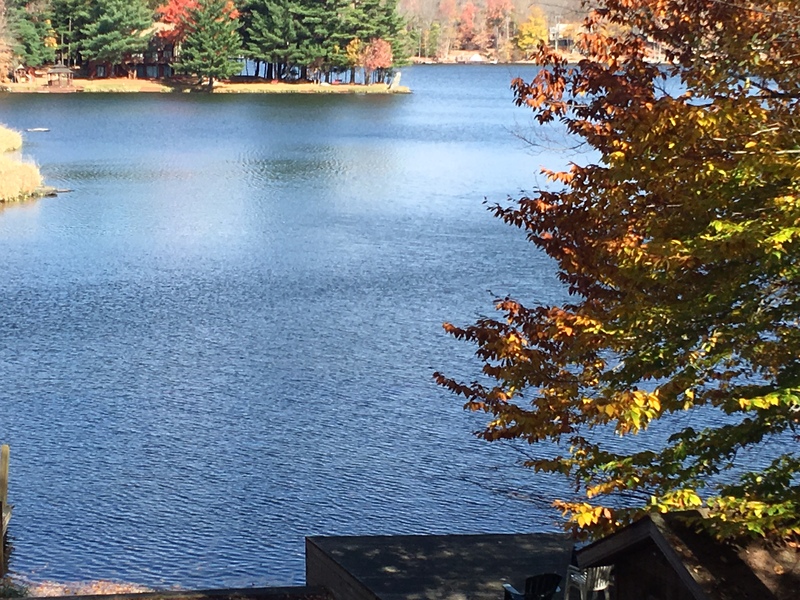 Surrounded by water and the trees, this Poconos Lakeside Escape can’t be beat as the ideal mountain getaway. 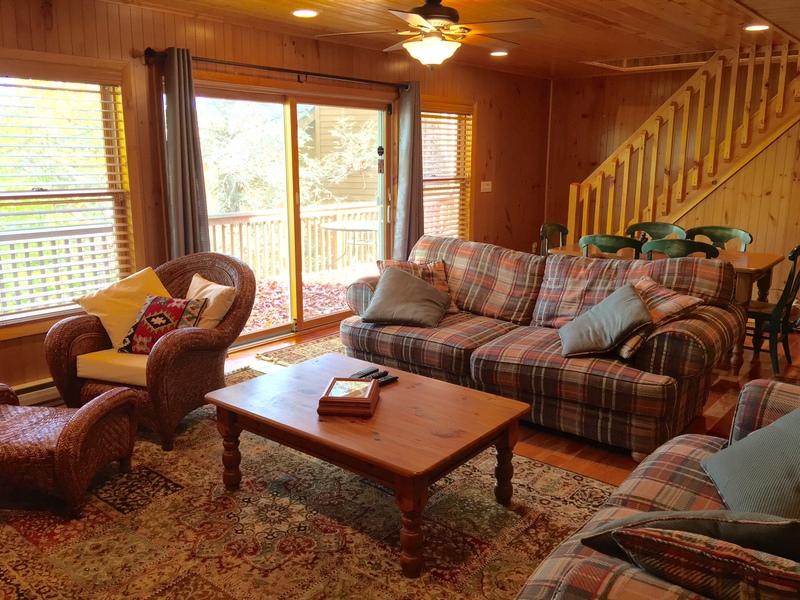 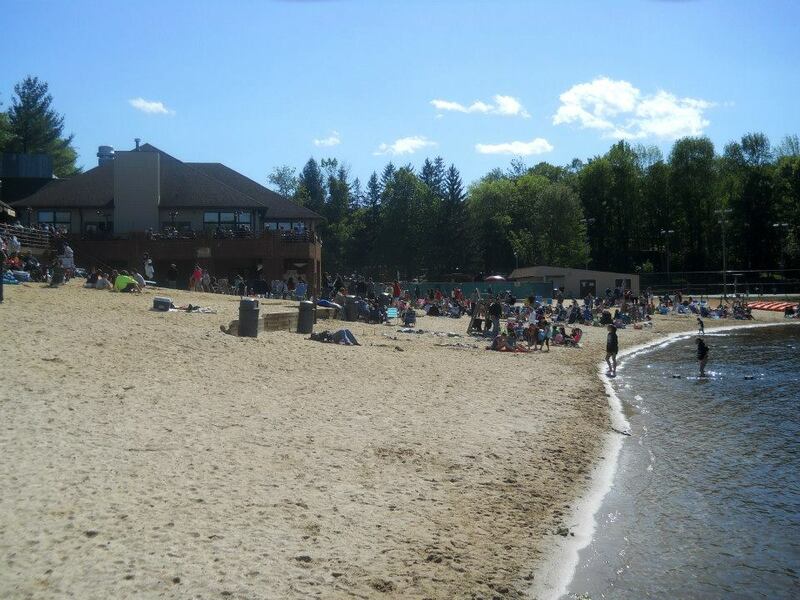 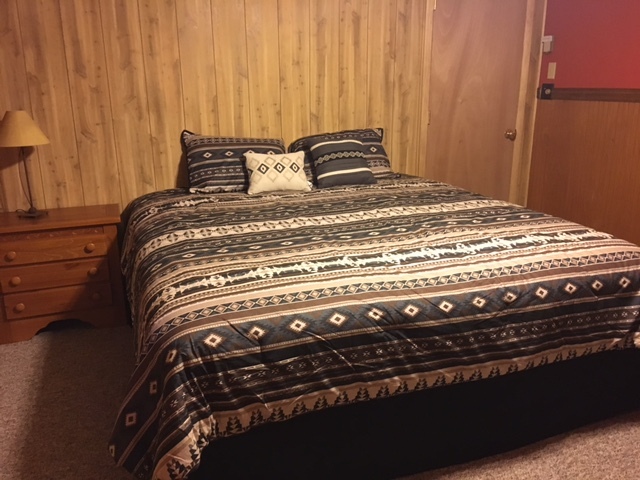 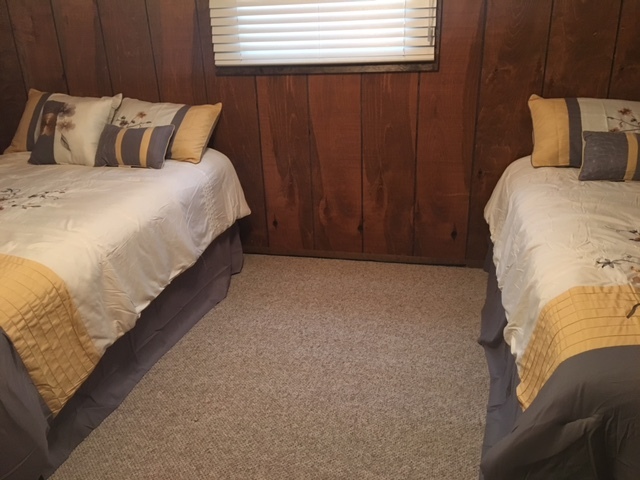 CLICK HERE to inquire about the availability of specific dates at Lakeside Escape 566. 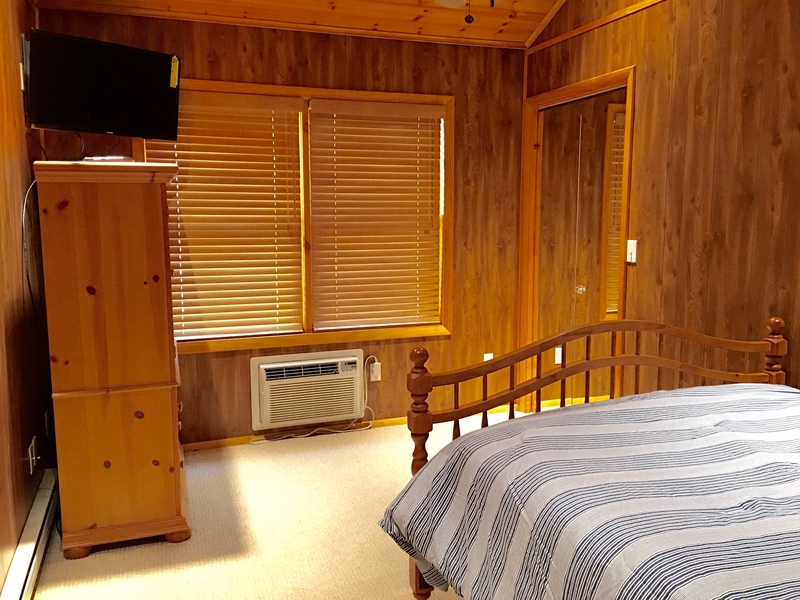 If you include full details — your name, phone numbers, an accurate email address, and your preferred dates — we’ll do our best to reply within 24-48 hours.